Hello everyone! Look, I'm updating my blog again! Be excited (cause I know I am)! Sorry for being MIA for a bit, but you know how it goes. Life happens, and I've been more interested in keeping blogging/vlogging balanced between being present in life and just experiencing moments and making memories with friends. In the long run, what's gonna be more important? But I still love blogging, so I'm back for a quick update post! I actually have several posts coming your way that are just taking a bit more time to put together, but I'm excited to share what I've been up to with you! So stick around and don't give up on me. In case you missed my video showcasing these looks on my Youtube channel, I'll link it HERE for you to check out. However, if you're more of a photo person, I decided to round up some screenshots and show you how I wore each of these pieces from Dressin. For a thorough and honest review, be sure to watch the video! 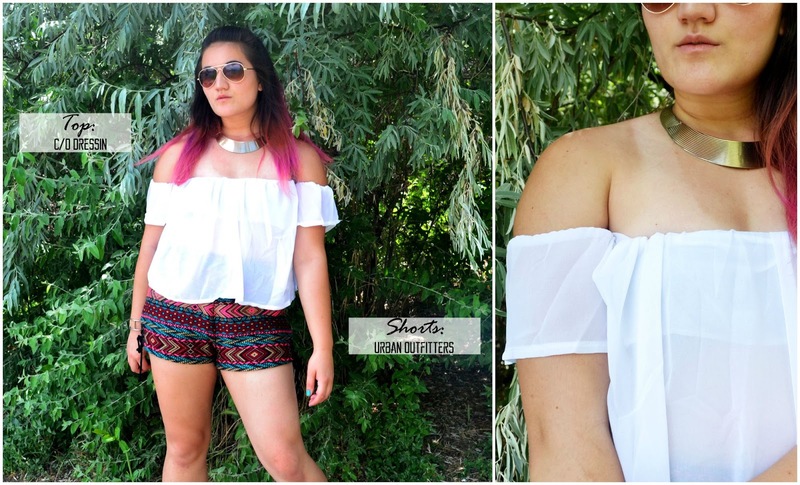 While the shoulderless top from Dressin wasn't the best item out of this roundup, it's definitely the coolest summer piece! See why I give it a 1/5 stars in the video review. 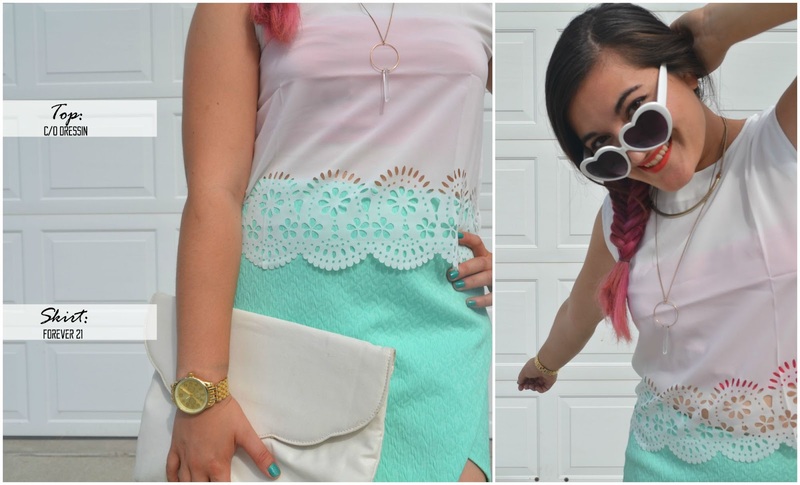 For photos, it looks pretty cool when paired with fun patterned shorts! I am digging this romper! Thankfully it has an elastic waist for heavier set girls such as I, and the navy color is such a chic tone to play with. Accesorized with heavier, bold black pieces, it makes for a fun look to wear out for a date! Oh, and these reflective sunnies? My absolute favorite item from this review! They're amazing, good quality, and under $4. Seriously, do yourself a favor and check them out! This last look features my other favorite item from Dressin, and that's this cutout tank top. The delicate pattern at the bottom is just so intricate and lovely! Paired with a mint skirt from Forever 21 and a pink bandeau underneath, I felt a bit like a watermelon, and what screams summer more than that colorful and tasty fruit? What do you guys think? Would you give Dressin a try? Sorry for not posting in a while, but I've finally got an apartment locked down! Ahhh, so much relief from knowing I won't be homeless next semester! Now what's coming up is moving everything back to Boise...sigh. the cut out top is gorgeous! :) Love these looks! cute outfit! I really love that off shoulder top! Yay for having an apartment! Haha, you're just a busy bee, aren't you? Moving around is so tiring and it seems like you just keep doing it during those college years, eh? I'm hoping it goes smoothly for you! You're always cute as heck and I love how daring your outfits are. Your sunglasses on the second one are lovely. And that off the shoulder top--NICE. I really hope those are making a comeback! Wow, that romper looks perfect and those sunglasses truly are cool! Love love love that blue romper! I'm so happy you were able to find an apartment, that can get seriously stressful! (and sorry about having to move all over again, packing is just the gift that keeps on giving). I hope you've been having a ton of fun this summer, it seems like you've had some great adventures and yes - living in the moment is way more important than blogging. Ugh and just because i've been an awful blogging friend, i hadn't realized you dyed the tips of your hair, it looks freaking great! The color is so vibrant and it really suits you! those urban outfitters shorts are amazing!! !